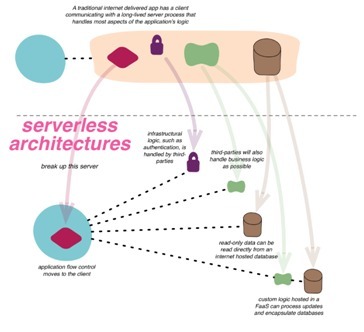 Serverless will Eat Containers in the Microservices world. IaaS is eaten by Containers for a while now. Making it easy to move workloads to the Cloud and split them into independently scalable units. Container technologies have (had) a maturity challenge with running systems in production. The vast number of tools needed around containers is a sign of immaturity. A good read: Docker in Production: A History of Failure, and don’t forget to read the comments. It will take some more time, although I think it is almost there, to get Containers to the level of maturity systems require in production. The benefit of containers, with the easy distribution and scaling, makes it a technology which is here to stay for a while. With the new kid, Serverless computing, on the block container will see workloads shrink. Serverless with its optimized run capabilities will take lots of work from Containers. They are easier to deploy, don’t require a host and have scalability in the box. The interesting question is, is Serverless mature enough to run production loads. From an operation perspective, there are some challenges, some holes in the tool support or in the cloud platform capabilities. Serverless often referred as “NoOps” isn’t completely right. With the ease of deployment and the enormous amount of services, monitoring is a challenging job. Not monitoring the operating system or network level but on the business process level. Updating or adding a service can impact the business flow, knowing the health of your business process is something you now have to build your own. It’s possible that containers as a standalone concept will be a shooting star that fades quickly. With the help of serverless computing, microservices can evolve beyond containers and provide a more effective and efficient platform for developing and executing code. What do you think? Clemens Reijnen is a Management Consultant at Sogeti, specializing in Application Lifecycle Management. He facilitates ALM courses throughout Europe and is a frequent speaker at many conferences.